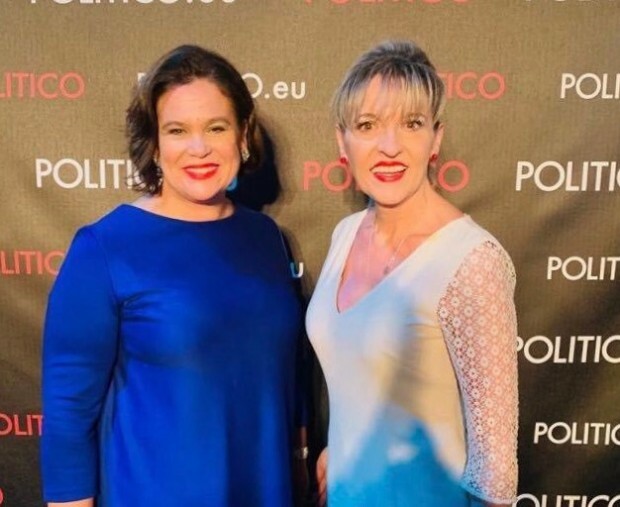 Sinn Féin President Mary Lou McDonald and Sinn Féin MEP Martina Anderson pictured at the Politico28 Awards in Brussels last night. Sinn Féin President Mary Lou McDonald TD has been named as the “Top Disruptor” in Politico’s European Leaders Class of 2019. Every year the European news service compiles a list of 28 people who they believe will shape Europe in the year ahead, with Teachta McDonald being ranked ahead of political heavyweights such as British opposition leader Jeremy Corbyn, Danish MP Mattias Tesfaye and Greece’s Eleni Touloupaki. After receiving the accolade, Ms McDonald said: “It is an honour to be awarded this recognition at a time of great challenge and change in Europe and Ireland. The awards ceremony came at the end of a day of political engagements in Brussels at which we discussed Brexit, the future direction of the EU and Irish Unity." The Dublin Central TD who became the Leader of Sinn Féin in February 2018, has been recognised for her determination to get the best deal for Ireland in regards to Brexit, and for her prominence in the successful referendum campaign to repeal the 8th Amendment in May. The publication also noted how Sinn Féin has put itself at the forefront of Ireland’s movements for social change, including the legalising of gay marriage in 2015. Politico has nicknamed Mary Lou McDonald as the ‘The Unifier’ stating that they believe she will “be hoping Brexit’s bedlam will help realise her party’s dream of a united Ireland”. Speaking today, Deputy McDonald said: “Following the Brexit referendum vote, Sinn Féin campaigned for the vote of the people in the north to be respected and for the unique circumstances of Ireland to be recognised. “While others called on us to simply accept the imposition of Brexit, Sinn Féin called for a special status for the north to protect the Good Friday Agreement, to safeguard the rights of citizens and to ensure that there would be no hard border in Ireland. “This is now Irish Government and European policy and is reflected in the legally binding Withdrawal Agreement. I want to thank the Sinn Féin teams in London, Belfast, Dublin and Brussels for making this possible. “However, we have more to do to make sure that the Withdrawal agreement is implemented and that the rights of citizens are safeguarded." In a profile piece on Politico’s website, they have outlined Mary Lou’s rise to the top stating that “along the way, McDonald has matured into the most prominent woman in Irish politics”. The publication has noted her success in becoming Sinn Féin’s first member of the European Parliament in 2004, her election as deputy party leader in 2009 and how she “provoked curiosity” when she first entered the Dáil in 2011. The former MEP for Dublin has said that the foundation of a new Europe which we will see in the coming year “must be a break from the failures and policies of the past”. Teachta McDonald said: “The future Europe must be a social Europe, a Europe of equal nations that works for citizens, safeguards the environment, and respects the Irish sovereignty and neutrality.